Comments are welcomed and encouraged. No prior registration is required to comment, no Captcha box to prove you are human. If you prefer, you can post anonymously, though a consistent “name” is preferable. My advice: get a free Gravatar. identity. To avoid email harvesting bots on the internet, I recommend posting from an alias account (hotmail or gmail)and not your prime email address. As a consequence of this extremely liberal policy there are some circumstances where comments may be edited or deleted. You don’t enter a man’s home as a guest and then start to insult him or his guests. This is my blog, my rules, not a public square. Please note: this is an Anglophone blog. Comments must be written in English or sufficiently passable English, in order to be understood. The only exception is certified residents of the planet Saturn, who are welcome any time. Comments should be relevant to the post topic and the blog subject material. Comments deemed to be spam, promoting products or services, or soliciting/sale of records, will be deleted. Regarding Ebay sellers – if you have an issue with a particular seller, this is not the place to air them: take your issue to Ebay, who police their own transactions. Harming someone’s reputation can result in legal action against you. 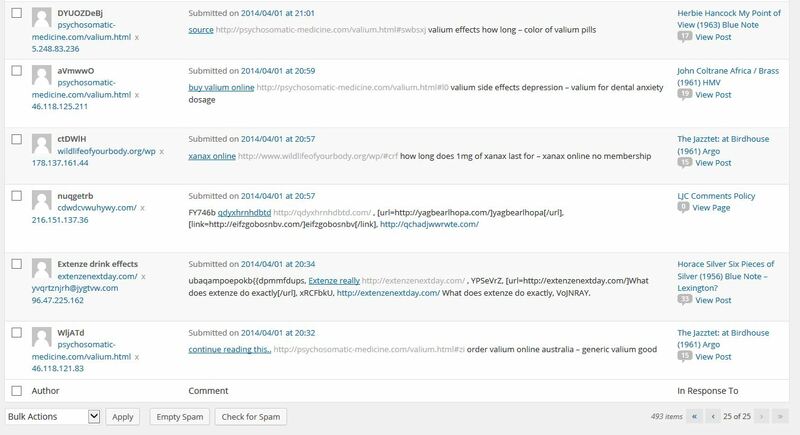 Commentors are welcome to include hyperlinks to other web material, but need to be aware of WordPress’s automatic spam filters (see below) which tag posts containing multiple hyperlinks, though one link only will usually pass. Music stirs the emotions, and many opinions about it are passionately held. To enable civilised exchange of opinion, the following principles apply to comments on LondonJazzCollector. You may not agree with all of them, but please respect them: they are my opinion. No one else knows what you hear, you do not know what someone else hears. No two people have the same listening history. The “best you have ever heard” may be true for you but not someone else. No two people have the same music playback system. A recording can sound great on one system and weak on another system. Different copies of the same record can sound different. Your experience is only a sample of outcomes, other peoples experience may be different to yours. Sound quality is subjective, there is no scientific measure of sound quality (setting aside defective engineering processes) The only benchmark is live performance. Recorded sound preferences differ. Some listeners prefer mono format, some stereo; some like lots of bass, some prefer more controlled bass. Your preferences, your opinion. Opinions are valid, but that doesn’t turn them into “facts”. Other people’s opinions are as valid as yours. State your opinion, that’s it, you are done. Personally, I don’t like “fisking” – where someone quotes another poster’s opinion, which they then proceed to take apart. It discourages people from contributing their opinions, which impoverishes us all. That’s my opinion. If you have got to the end of this list, and are still in your comfort zone, well done, you are ready to type. There is a lot of pleasure to be had exchanging opinions, learning new things. Respect differences in opinion, have a civilised discourse. Even if this is the last place on the internet where such a thing exists. Play nicely and we will get on fine. If you don’t like what you find here, there are plenty of other blogs which may be more to your taste, or you could always start your own. LondonJazzCollector reserves the right to edit or delete any comments submitted to this blog, without notice. By commenting here you are accepting these policies. I have previously been able to look through comments tagged as spam to rescue the odd genuine comment. However I can no longer wade through 500-odd comments a day. From now on all comments tagged by WordPress spam filters will be deleted automatically. If you post a comment containing several weblinks, which does not appear immediately you can always contact me directly (address on ABOUT page), and I may be able to fix it. Posting multiple links to other web content will likely fall foul of spam filters. It may be preferable to copy and paste text into comments. Less efficient, but that is the world we live in.